To me, Creativity is a dance with our infinite soul in our expansive universe. For some it’s a tranquil space of surrender. It is definitely a way into joy. An expressive avenue for the soul. A brush with high flowing energy. Creativity is not just new ideas or where solutions may stem from. It is a variety of energy that can be channeled in infinite ways. It can be an escape from the busyness, chattering, and problems of the world. Creativity comes from a perspective of openness and curiosity. It’s like tapping into the unknown. An outlet to release our energy and many times calm our negative emotions. Creativity fires many wires in our brains. A connection from the heart and soul. The more creative I feel, the more life-giving energy I feel. It can feel like freedom and empowerment. A balance between the mind and soul. A channel for your soul to express itself. Creativity opens the floodgates of our imagination and the possibility of innovation. It allows the dreamer into a tangible reality. It’s an invitation. Receiving some answer to our soul’s calling. We can’t always describe it, but we feel it when we are in that flow. The state of enjoyment. In this space, we lose time and worry. Our focus is matched with higher vibrations. When we can allow some creative space, we open ourselves up to the masterpieces within. 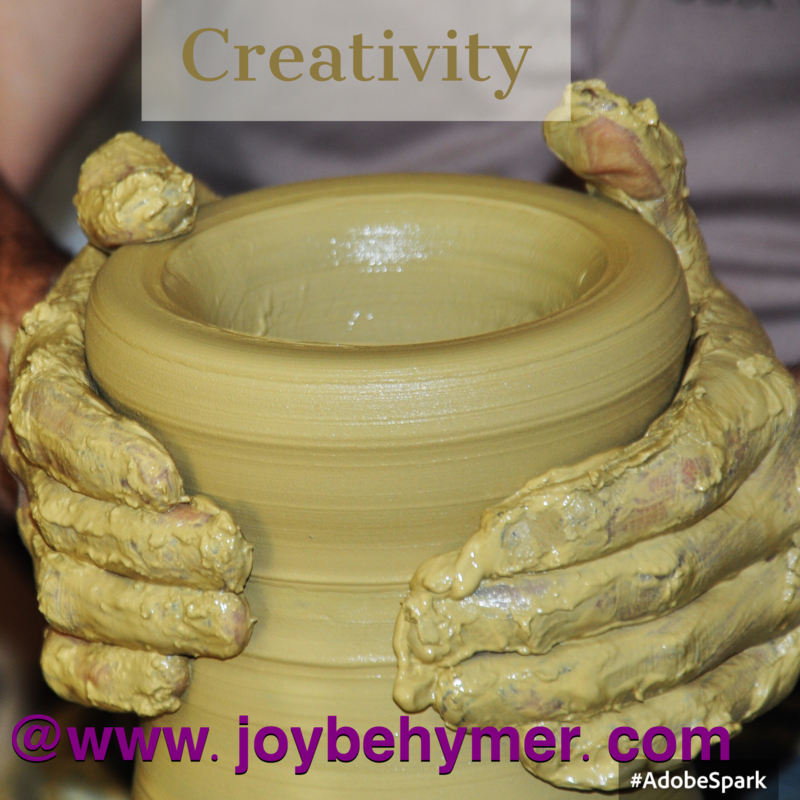 The more we say yes to creativity and the time to explore, we start living more joy-filled creative lives. I’ve found not only is the act of being creative itself helpful to my soul, but it also helps improve my performance in many daily tasks. I find that as I give time to my creative avenues, it gives me fuel for my work and responsibilities. The better you feel, the easier it is to do more of what you love and even the things in life that may not be as fun. Sometimes we can get stuck in our left brain thinking we aren’t creative, but if we can allow some space and possibility along with some practice, we can tap into unlimited potential. We just have to give ourselves permission to move into the unknown energy. You do not have to be very talented or a master at something to be creative. It is simply saying yes to a bit of play and light-heartedness. Creative endeavors allow the child within to explore. To let that feeling of youth and fun flow through. A smile from within your soul. Many people get these elated feelings from deep and regular meditation practices, but playing with our creativity can also be meditative. We have many ways to infuse more peace and tranquility into our lives, and being creative certainly adds a life onto its own. Allowing some time each day or week can improve our moods more regularly. When we can balance life with some uplifting enjoyment, we add lighter and higher energy producing better vibrations. Think about how good it feels when you feel good. I encourage you to say yes to creative energy. Whether it be through your work, play, or hobbies, you can experience deeper dimensions within yourself. You are a masterpiece always waiting to shine. Allow this inner love to move through. Express your lovely self more. Allow some magic in your life. The magic of you. Our relationships are more than a contract of love. They are also opportunities for growth and expansion. In all of our relationships, we have times of good connection and bad. Through the journey in life we have many opportunities to expand love. We also have the opportunity to disconnect and separate. Many of our relationships can be challenging. We aren’t always surrounded by our ideal set of people. We attract what we need to teach us what we are vibrating inside. 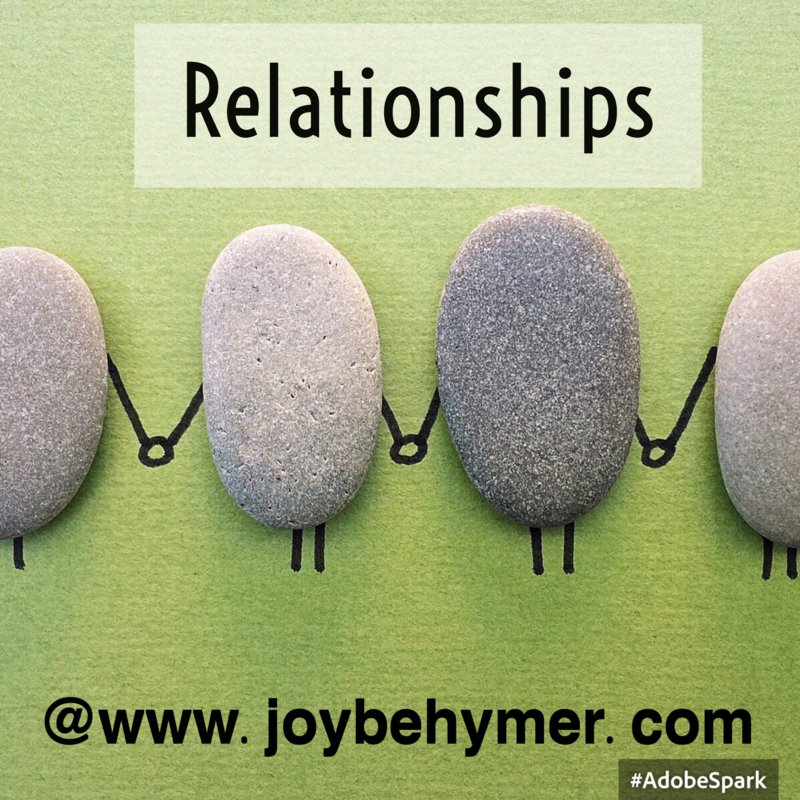 Our relationships can often reflect the things we haven’t dealt with. No matter how much or how deep our love is for our families, spouses, and children, we will have interactions that we provoke from one another. Things we have the opportunity to face and work out. Often our triggers play out through defensiveness. When we feel defensive or hurt, we are preventing ourselves from listening openly with our hearts. We may have some deep-rooted seeds from childhood or past experiences that we haven’t worked out and they play into our relationships later. Often when we don’t do the inner work, we may not even be aware of our triggers or the inner walls we’ve built. We may have many excuses and reasons for our defensiveness, but we also are ignoring our opportunity to grow. This can affect our feeling of wholeness. When we feel defensive, we shut down and put up our shields. We can’t let much love in. Not only are we blocking the love from ourselves, we are experiencing more difficulty in our relationships. It does require a bit of trust from yourself. We don’t always learn these foundations to aid in our relationships. When we point fingers and blame, we avoid seeing the truth within. We all have triggers we run up against, but to transcend them, we need to be more open and honest with ourselves about why we feel the way we do. Most of the time what triggered the emotion had little to do with the seed of our issue. We all act as mirrors for each other. It’s not always easy to acknowledge that the aspect we don’t like to see in another is what is coming from ourselves. It takes practice to think about our reactions before they come out of our mouths. It takes more openness and patience to move through what emotions we are experiencing and what we are protecting ourselves from. We use our emotional shields to try to protect ourselves, but they usually keep showing up until we deal with them. We are wired to feel instinctively protective, but we are also capable of transcending pain. This can certainly separate our connection with ourselves and each other. There is a time to protect ourselves from imminent harm and danger, but what I’m referring to is how our shields and defensiveness plays out into our relationships. Especially in our discussions, arguments, and disagreements. We don’t always heal our triggers in one discussion or instant, but we can learn to be more aware of what is coming out and going on within. When we can listen more openly;, we can not only deepen our connection in our relationships, but also in ourselves. The more we face ourselves and heal our wounds, the more we raise our frequency and help those around us create the space to do the same. Our own healing heals the world. Together can help each other grow and heal. The things I’ve learned the most from on my journey to reach my dreams are the many messes I’ve made along the way. (“Mess” is just a word I like to use for when we can’t understand what is happening or when we come up against unknowns.) To learn to embrace the mess is where the magic tends to happen. We often think that if we have a well designed plan we avoid the messes and problems. Well, my friend, I’m here to inform you that the messes will be there at times and can add some value. Sometimes the value is the simple appreciation you gain in obtaining your goals. They can be a teacher in things that work well and things to avoid. They may be the fork in the road to lead you in a better direction. Although our minds can envision many goals, we don’t get the crystal ball to know all the details we will need before we embark. This fear is often what stops us in beginning journeys or gathering the courage to follow our dreams. The beauty is that you can experience your dreams through the messes. You will go through many experiences along the way. Many times when you reach a goal or an accomplishment, it isn’t until then that you notice your experience and knowledge came from the journey and not the end goal. The messes can help you gain the experience you may need and make you stronger by the time you reach your destination. The point is that just like life will reveal some messes, you get them along with your passions and purposes as well. Learning to embrace the mess of the unknown is a way to move through them without giving up. Just because you move through a difficult fork in the road, doesn’t mean you have to throw in the towel or that it isn’t going to work out. Anything worth a journey is going to show you some bumps and upheavals. I’ve also found in looking back at some adventures, they probably would have been boring or lost momentum if I didn’t get to experience some messes along the way. The messes are often what makes the great story. Imagine watching a movie without any conflict or plot. I know my family often gets bored with movies if they don’t involve some action!. 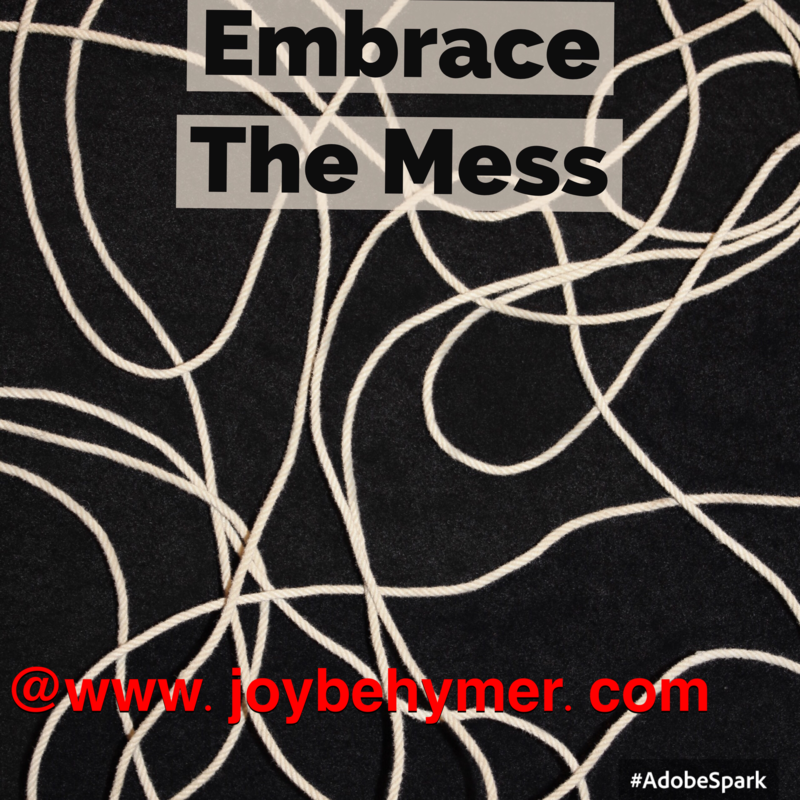 We can embrace the messes in the journey and view them as our exciting points and moments along the way. We often react with despair when things do not move smoothly and difficulties arise. It can take a different way of looking at things to move through them. Especially problems we encounter. It’s a choice in how we see our messes. Are we viewing them as problems, or as a balance to a better solution? If the opportunity didn’t present itself, you may not see the need to change it. Think about it as a leaky faucet. You could get angry that the faucet is leaking, or you could be grateful that you found it before major damage was done. You at least had the opportunity to try to take care of it before a worse outcome presented itself. I’m sure there are some things we can often agree on. It’s not always fun to do home repairs and pay taxes. But we can choose a more positive approach to those things. If we have home repairs, it means we have a home. If we have taxes to pay, we have some money to circulate. I know some people who love home repairs and that is why they do it for a living. They like the adventure of solving those problems for people. We all move through messes differently. We can embrace them as puzzles to solve. We can also seek help from those who enjoy the puzzles and mystery. Regardless of how we choose to handle them, we have the option in our reactions to them. When you change the energy of a mess or problem to an opportunity or a blessing, not only do you empower yourself in how you handle it, but you also raise the vibration of how you experience it. How you move through the messes is a choice. You have the option to move through them with anger and frustration. Perhaps even kicking and screaming along the way. Or… You can infuse them with some hope, faith, and maybe even some joy. Being in peace doesn’t mean nothing will ever disturb you; it means you can experience each disturbance calmly and resiliently. As we move through life and along our journeys, we have a choice to embrace our messes and to move through them with more grace and ease. When you can appreciate the obstacles, you may be able to see more possibilities and receive more solutions just by changing the energy you infuse them with. I’m a firm believer that you can change your outcome by adjusting your attitude. When you can focus on your feelings, you are able to understand what is coming into your life and the option to change it. We aren’t taught in our society how powerful our thoughts and feelings are. Once you know your thoughts turn into things, you can use this leverage to your advantage in your life. I often find that people who are generally sarcastic and pessimistic do not realize they are bringing more negativity to them. What you project out into the world is what you attract and see more of. Basically the more you complain, the more you will find things to complain about. The troubling part is that it can become a habit that hurts you more than you may notice. The good news is that you have a choice every day in each moment of how you look at things and what you feel. You can change any habit around, but it doesn’t seem to happen immediately often. To change any habit, it requires practicing it repeatedly. Once you do this long enough, you reprogram your subconscious mind to develop the habit into the better one. Then it becomes second nature in your thoughts and reactions. For example, let’s say you are predominantly negative. If you notice yourself mostly complaining or saying pessimistic things, you are pulling this from other people you interact with and from the universe. It really helps to pay attention to the thoughts you are thinking, the feelings you are feeling, and the words you are saying. Once you are aware of these habits, you can better understand what you are experiencing in life. You may also be able to understand the people whom you have attracted in your life. If you are feeling predominantly positive and good things continue to improve for you, you have a strong foundation to build upon. I highly encourage you to keep up the good work. You will reap more and more rewards for the kindness and positivity you put out into the world. If you feel like things look pretty gloomy or you just notice how bitter and negative you feel, you can slow it down and start turning it around. It doesn’t happen all at once, and often baby steps are the easiest. I can tell you from experience and in practicing my better thoughts the past few years, it took patience and persistence. Science also shows you can turn it around and reprogram those pesky habits. The more you practice and the more you can pivot the negative feelings around, the easier it gets. Just like going to the gym and building muscles, you get stronger. As we find ourselves in the New Year, we often see it as a new start with new opportunities. Many people take this time to create new goals, discover improved ways of living, or set their minds to accomplish better intentions. Some of the top changes that many intend to make are to lose weight, eat healthier, go to the gym, quit smoking, and reorganize their homes. This takes time, patience, and love. You most likely developed the habits over time and replacing these ways of thinking takes time as well. Remind yourself of that, and of how powerful and capable your brain really is. Talk to yourself like you are your friend on this journey. Your body and mind need your support to perform their miraculous new changes! . In those first steps when we don’t get the results quickly, we may disbelieve the change is possible. That is how we easily slide back into our old habits. Just like weeding a garden so new growth can come through in the spring, we need to do the same for our minds. It may take some time to replace our weeds with seeds. If you observe or study a garden, it takes some time, love, and patience to grow our fruits, vegetables, and flowers. Remember this as you feel challenged in the process of change. You have to be as gentle with yourself as if you are caring for your own plants and gardens. Just as they respond more positively with love, so do you. I encourage you not to give up on yourself and keep going. Setbacks and falls are just feedback in what you’re thinking. Rather than getting frustrated or beating yourself up, use the knowledge to see where you can heal those triggers. Treat yourself with loving kindness so you can bounce upwards to those higher vibrations and better feelings. The better you feel, the better life can get. Focus on those feelings. When you feel good, focus on all the things working well. When you feel bad or negative, work on rotating those around by noticing your responses and figuring out how you may can change them for the better. It’s a daily practice. It requires paying attention and focusing on your feelings each day. The more aware you are, the better you can choose what is best for you.